This article is about the song. For other uses, see Suspicious Minds (disambiguation). "Suspicious Minds" is an American song written and first recorded by American songwriter Mark James. After James' recording failed commercially, the song was handed to Elvis Presley by producer Chips Moman, becoming a number one song in 1969, and one of the most notable hits of Presley's career. "Suspicious Minds" was widely regarded as the single that returned Presley's career success, following his '68 Comeback Special. It was his eighteenth and last number-one single in the United States. In 2004, Rolling Stone ranked it No. 91 on their list of the 500 Greatest Songs of All Time. Session guitarist Reggie Young played on both the James and Presley versions. The song is about a mistrusting and dysfunctional relationship, and the need of the characters to overcome their issues in order to maintain it. Written in 1968 by Mark James, who was also co-writer of "Always on My Mind" (which Presley would later record), the song was first recorded and released by James on Scepter Records in 1968. Chips Moman had asked James to come to Memphis to write songs for American Sound Studio. At the time, James was residing in Houston. James had written three songs that became number one hits in the Southern United States. American Sound Studio was gaining a reputation in the industry as the Box Tops had just recorded "The Letter" there so James relocated to Memphis. James said that late one night, he was fooling around on his Fender guitar and using his Hammond organ pedals for a bass line and came up with what he thought was a catchy melody. James at the time was married to his first wife, but still had feelings for his childhood sweetheart, who was married back in Houston. James's wife had suspicions of his feelings. James felt it was a confusing time for him and that all three were caught in this trap that they could not walk out of. At the recording session, James sang the lead vocals, and the studio band backed him with Moman producing. The horns, strings and vocals of the Holladay Sisters were later overdubbed. 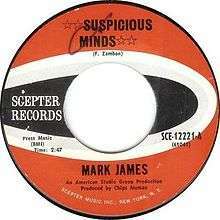 After the tape was mixed, James and Moman flew to New York, where James's manager had contacts with Scepter Records. The label loved the song and put it out, but Scepter did not have the money to promote new artists, and the song did not make the charts. Later that year, Don Crews, Moman's partner, told James that Presley had booked their studio to record what would become the From Elvis in Memphis album. Crews kept asking James if he had any songs that would be right for Presley. James felt Presley needed a mature rock 'n' roll song to bring him back as Tom Jones was a hot artist at the time. Crews and James thought of "Suspicious Minds" and James began urging others to get Presley to hear it. Even though James's recording had not been commercially successful, upon reviewing the song Presley decided he could turn it into a hit. Presley's recordings in American Sound Studio were a direct consequence to '68 Comeback Special, that interested Chips Moman in produce recordings to the new style of Presley, making his comeback to the Memphis musical scene, by recording rock, gospel, country, rhythm & blues and soul. Marty Lacker, a close friend of Elvis, suggested he record at the studio. These sessions produced the album From Elvis in Memphis. "Suspicious Minds" was a product of a January 23, 1969 session, that took place between 4 am and 7 am. It took eight takes to produce the final song, in which the lead vocal track was later overdubbed by Presley himself that same night. James was in Memphis, but he was not at the recording session. James had walked into the recording studio control room a few days earlier during a session and sensed that Elvis was uncomfortable with his presence. James did not want to jinx the song so he stayed away. When James heard the track the day after it was recorded, he initially thought it sounded too slow. When he later heard the embellished version, he said he was blown away. In later years, whenever Elvis saw James he would cross the room to say hello. Production of the song was nearly scuttled over a copyright dispute. Elvis's business people said they wanted half of Moman's publishing rights. Moman accused them of stealing, and Elvis' people threatened to halt the recording session. Harry Jenkins of RCA agreed with Elvis's people because he sensed that the song would be a big hit and there would be plenty to go around. The songs "I'll Hold You In My Heart (Till I Can Hold You In My Arms)", "Without Love (There Is Nothing)", and "I'll Be There" were recorded in the same session. On August 7, the song was again overdubbed to stereo and mono in Las Vegas, where the final master was produced. The song is noted for its change of time signature, in the bridge section, from 4/4 to a slower 6/8 and back again to the faster 4/4 rhythm. The instrumental arrangement uses an electric guitar, bass guitar, organ, strings, trumpets, trombones, and drums. Elvis' primary producer Felton Jarvis made the unusual decision to add a premature fade-out to the song starting at 3:36 and lasting for 15 seconds before fading back in. The first verse then continues repeatedly until it completely fades out. In a 2012 interview with Marc Myers of The Wall Street Journal, Moman disclosed that Jarvis was never happy with Elvis recording at American Sound Studio, saying "it was a control thing." Moman added, "So when Jarvis took the tape of 'Suspicious Minds,' he added this crazy 15-second fade toward the end, like the song was ending, and brought it back by overdubbing to extend it. I have no idea why he did that, but he messed it up. It was like a scar. None of which mattered. Soon after the song was released, Elvis was back on top of the charts." Future Grateful Dead vocalist Donna Jean Godchaux sang backing vocals on the track. The song was later included on the legacy edition of From Elvis in Memphis and the follow that dream reissue of Back In Memphis. Presley first performed the song at the Las Vegas International Hotel (later renamed the Hilton) on July 31, 1969, and the 45 rpm single was released 26 days later. It reached number one in the United States in the week of November 1 and stayed there for that week. It would be Presley's final number-one single in the U.S. before his death ("The Wonder of You" in 1970, "Way Down" in 1977 and a posthumous remixed release of "A Little Less Conversation" in 2002 all hit number one on the British charts, followed by re-issues of several previous chart toppers in 2005). 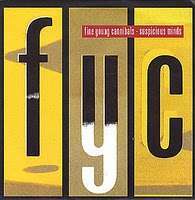 In 1986, the band Fine Young Cannibals' cover version of the song, which featured backing vocals by Jimmy Somerville, reached No. 8 on the UK Singles chart. The Fine Young Cannibals' music video for the song was filmed in black & white, and remains so for the majority of the song. However, the video is noted for its innovative use of colorization, following the bridge section of the song. The video pays its homage to Elvis, both in its use of the monochrome filming (common during Elvis' early career) and the shiny spangled suits that the band wear in the second half of the video. The Fine Young Cannibals cover was used in two cult films directed by Albert Pyun, first in his a 1986 action/thriller film Dangerously Close and then in his 1987 thriller film Down Twisted. (1992) "Ain't That Lonely Yet"
In 1992, country singer Dwight Yoakam recorded his version of the song for the soundtrack to the film Honeymoon in Vegas, as well as a video. It was later released on his compilation album The Very Best of Dwight Yoakam. "The Long and Winding Road / Suspicious Minds"
"Anyone of Us (Stupid Mistake)"
(2002) "What My Heart Wants To Say"
Gareth Gates, a runner up of in the first series of the ITV talent show Pop Idol released a cover version on BMG on 23 September 2002. 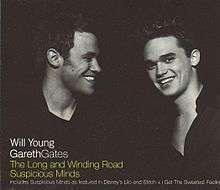 The single was a double-A side record containing "The Long and Winding Road"/"Suspicious Minds" with the Beatles song performed by Will Young, the winner of the same Pop Idol series, and Gates, with Gates performing the Elvis song on his own. The music video features Gates changing color alternating between black and white in a white background while clips from Lilo & Stitch are shown. The single reached the top of the UK Singles Chart where it stayed for two consecutive weeks (charts of 29 September 2002 and 6 October 2002), following two other No. 1s of Gareth Gates, also covers ("Unchained Melody" No. 1 for 4 consecutive weeks in March and April 2002 and "Anyone of Us (Stupid Mistake)" for another 3 weeks in July 2002). B. J. Thomas recorded the song for his 1969 album Raindrops Keep Fallin' on My Head. Waylon Jennings and Jessi Colter recorded the song for RCA in 1970. Their version reached No. 25 on the Billboard country chart in November of that year. The Jennings-Colter version was re-released by RCA in 1976, topping out at No. 2, and was included on the ground-breaking album Wanted! The Outlaws that same year. Jamaican rocksteady and reggae vocal trio The Heptones released a version of the song in 1971. Singer Judy Cheeks recorded a version for her 1978 album Mellow Lovin'. Singer Ronnie McDowell sang the song for the 1979 film of the soundtrack ELVIS (with actor Kurt Russell, portraying Elvis, appearing to perform the song in the film). Candi Staton had a No. 31 UK hit with her revival in 1982. Bobby Orlando released a Hi-NRG version of the song in 1988. Phish covered the song live numerous times during 1995 and 1996, notably available on the album Vegas 96. In 1996, Bowling for Soup included a cover version on their album Cell Mates. In 1997–98, U2 frequently performed the song as a karaoke version sung by The Edge during the Popmart Tour. At roughly the same time Elvis impersonator James Brown started his career thanks to singing the song at a karaoke bar in his native Belfast. In 2002, No Doubt covered the song on NBC's special "Elvis Lives". In 2004, Pete Yorn released a live recording of the song on his two-disc album Live from New Jersey. In 2006, pop-punk group Avail added a cover version of this song on their re-released 1998 CD Over the James. In 2007, Greek singer Sakis Rouvas recorded "Suspicious Minds" on his live album "This is My Live", however having previously also recording it for the Greek movie Alter Ego. In March 2009, Miss Kittin and The Hacker covered "Suspicious Minds" for their album Two, for which they filmed a promotional music video directed by Régis Brochier of 7th floor Productions. Their cover of "Suspicious Minds" was later featured on the downloadable for free mixtape Skull of Dreams by Little Boots. In 2009, Rusted Root covered this on their studio album Stereo Rodeo. In 2009, South African singer Steve Hofmeyr recorded a version of the song on his album Tribute, while another South African singer, Ray Dylan, released a version on his album Goeie Ou Country Vol. 2. The Bourbon Cowboys, a Blizzard Entertainment in house band, recorded a cover of the song for inclusion in Starcraft II: Wings of Liberty. The song is one of the few licensed songs that can be heard on the jukebox that appears between missions. Blizzard released the song on the album Revolution Overdrive: Songs of Liberty. Rock band Glasvegas featured Florence Welch of Florence and the Machine in a live cover at NME Awards in 2009. Clay Aiken recorded the song on his 2010 album Tried and True. Amanda Lear covered the song on her 2014 Elvis Presley tribute album My Happiness. An over 5-minute track was edited down to 3:52 for the single release. Martina McBride covered the song on her 2014 album, Everlasting. 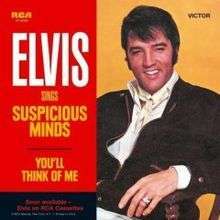 "Suspicious Minds" has also been translated into a number of languages. It was performed in Dutch as "Door achterdocht verdoofd" by Guido Belcanto on the album Elvis Belgisch released in August 1992. In 1997, an Italian language version was done by Luciano Ligabue with the title "Ultimo tango a Memphis" and is found on the album Su e giù da un palco. Italian singer Gianni Morandi had a version called Che Cosa Dirò that translates as 'What Shall I Say'. ↑ "Suspicious Minds - Elvis Presley". AllMusic. 1 2 3 4 5 6 Myers, Marc (2012-08-30). "Caught in a Trap: Elvis Presley's Last No. 1 Hit, Suspicious Minds | Anatomy of a Song - WSJ.com". Online.wsj.com. Retrieved 2014-05-10. ↑ The Chicana/o Cultural Studies Reader - Google Boeken. Books.google.com. Retrieved 2014-05-10. ↑ Awful Gestures - Adrienne Weiss - Google Boeken. Books.google.com. Retrieved 2014-05-10. ↑ "Suspicious Minds by Elvis Presley Songfacts". Songfacts.com. Retrieved 2014-05-10. ↑ 1001 Songs: The Great Songs of All Time and the Artists, Stories and Secrets ... - Toby Creswell - Google Boeken. Books.google.com. Retrieved 2014-05-10. ↑ "Solid Gold Spotlight: Suspicious Minds". About.com. Retrieved 2010-11-09. ↑ "Grateful Dead Family Discography: Donna Jean Godchaux Discography". Deaddisc.com. Retrieved 2010-04-29. ↑ "Go-Set Australian charts—January 10, 1970". poparchives.com.au. Retrieved August 12, 2016. 1 2 3 4 5 "Elvis Presley—Suspicious Minds". dutchcharts.nl. Retrieved August 12, 2016. ↑ "Search Charts > Search by Song Title > Suspicious Minds". irishcharts.ie. Retrieved August 12, 2016. ↑ "Elvis Presley – Chart history" Billboard Adult Contemporary for Elvis Presley. ↑ "Item Display - RPM - Library and Archives Canada". Collectionscanada.gc.ca. Retrieved 2014-05-10. 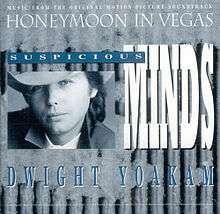 ↑ "Videos : Dwight Yoakam : Suspicious Minds". CMT. Retrieved 2010-04-29. ↑ "Top RPM Country Tracks: Issue 1828." RPM. Library and Archives Canada. December 26, 1992. Retrieved August 15, 2013. ↑ "Dwight Yoakam – Chart history" Billboard Hot Country Songs for Dwight Yoakam. ↑ "Suspicious Minds Every Time Played - Phish.net". Retrieved 2014-06-06. ↑ Vaziri, Aidin (1999-05-23). "Q & A With An Elvis Impersonator". San Francisco Chronicle. Retrieved 2014-07-17. ↑ "The King and I". Belfast Telegraph. 2010-01-08. Retrieved 2014-07-15. ↑ "Britney, Bono, No Doubt to Bow Down to King on TV Special". Retrieved 2002-09-10. ↑ "Over The James [Explicit Lyrics] MP3 Downloads". Amazon.com. Retrieved 2014-05-10. ↑ "Miss Kittin And The Hacker* - Two (CD, Album) at Discogs". Discogs.com. Retrieved 2014-05-10. ↑ "Miss Kittin The Hacker : Suspicious Mind clip – 7th floor". 7th floor. 2009-06-05. Retrieved 2011-02-27. ↑ "Little Boots Mixtape – 26 Aug 2009". Clash. 2009-08-26. Retrieved 2011-02-27. ↑ "Download New Little Boots Mixtape "Skull of Dreams"". Tape Recorder. 2009-08-25. Retrieved 2011-02-27. ↑ "Tribute – Steve Hofmeyr – Listen and discover music at". Last.fm. 2013-11-26. Retrieved 2014-05-10. ↑ Ray Dylan (2010-11-01). "Ray Dylan, Goeie Ou Country - Vol.2, CDs, Musica A World awaits - 6005298030511". Musica.co.za. Retrieved 2014-05-10. ↑ "Suspicious Minds - Amanda Lear". www.allmusic.com. Retrieved 2014-06-14. ↑ "Original versions of Suspicious Minds written by Mark James". SecondHandSongs. Retrieved 2014-05-10. ↑ "Elio e le Storie Tese - Suspicious mind". youtube.com. "Always Late with Your Kisses"
"It Only Hurts When I Cry"
"The Heart That You Own"
"Try Not to Look So Pretty"
"What Do You Know About Love"